A few weeks ago I was leaving my house, when I spotted a small foil-wrapped egg on the footpath. Intrigued, I picked it up, then put it in the bin. 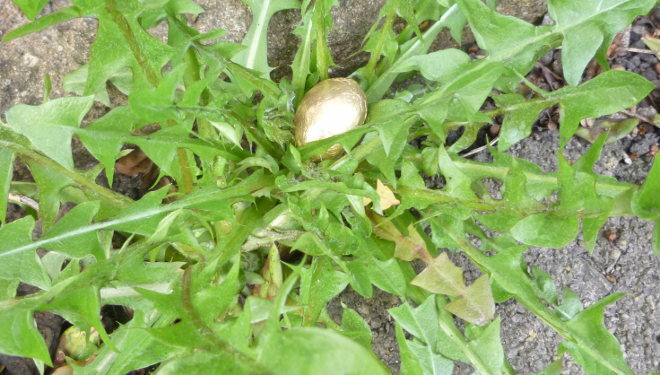 Days later, a glimmer of gold caught my eye and I found an identical egg nestled in the leaves of a dandelion like a small precious meteor. #Writingprompt Where could these eggs have been coming from, and why? And more curiously, if they’re intended as Easter offerings, why were they appearing so early? This entry was posted in Writing prompts and tagged creative ideas, Easter, inspiration for writers, story ideas, writing inspiration by Judy. Bookmark the permalink.